For your visit to Las Vegas, you will have the ability to choose from the largest number of hotels in one city, in the world. That guarantees your ability to find the best room for the best price, hands down. With monorail system and public transportation, you’re connected to all major casinos and attractions. Las Vegas began as a stopover on a pioneer trail to the West and has become a mecca for gambling, live theater, adult burlesque shows, and excitement of every kind. Contrary to popular belief, room rates in Las Vegas seem to reduce during the hot summer months. This can be an advantage for the gambler, because lets face it, air conditioners and no reason to go outside? If you are a sun goddess, then it’s also good for you, with cheaper rates and poolside pleasures. Probably the only one suffering at that time of year is the vacationing golfer, who will have to aim for a 6 AM T-time to endure 18 holes. Magic Savings Tip: Gamblers and pool goddess’s, book your trip in heat of summer. However, watch out for big conventions and headliners bringing occasional higher rates. Keep in mind, all the major hotels are competing for your reservation, because they don’t make money on the room, rather how much you loose in their casino. Strolling the shops at Caesars Palace, Light show at the pools of the Bellagio Resort, The Mirage and Siegfried & Roy’s tiger show and Circus Circus carnival, rides and for the kiddies the dinner show at Excalibur Hotel. Guys, maybe the hot wings and “visual pleasures” at Hooters Hotel and Casino on your much needed break from the table games. Visit the “Old Town” Las Vegas and original casino hotels there or take a guided tour and hear the history of Vegas, complete with stories of gangsters and the bodies buried in the desert. Maybe it was Paris that you really wanted to visit, so take a trip to the top of the Eifel Tower. If the Wine Spectator can repeatedly award this restaurant for the best wine list, then surely the fine dining will exceed your expectations too. Enjoy the fine artwork hanging on the walls as you sip your way through that prime steak. If you haven’t heard of Chef Emeril Lagasse, where have you been? One of the top Chef’s in the world, Emeril’s restaurant Delmonico and Wine Stewart will assist you in pairing that perfect steak with only the best wines of the world. A Charlie Palmer restaurant that will leave you satisfied beyond desire, both with the dining options, as well as his tower of wines. You may find that you have spent a great deal of your gambling monies, but be so happy you dined here, that you just won’t care. Take a jeep tour in the desert, or jump in your jeans and boots or sneakers for a trail ride. If the trail ride is your pleasure ladies, please leave the 8 inch heals back in your room. Another fun day trip is to the Hoover Dam, a sight you just have to see. All of these adventures can be arranged from your hotel Concierge. The city is literally filled with hotels and resorts, proven with its world record for the most hotel rooms in one city. So how do you choose where to stay? Resorts on every block are competing for your reservation meaning even a modest budget will allow you to experience the glamorous life. If you want to spend a weekend living in decadence, book into the Flamingo Hilton Hotel or MGM Grand. Combined with seeing a Broad-way style show like Love Cirque du Soleil at the Mirage will see you living the high life. For those less concerned with where you sleep, consider booking into a smaller hotel to increase your spending money. The Hard Rock Hotel and Casino removes some of the extravagance of the larger resorts but keeps you close to The Strip and still has an in-house casino. For an eco-friendly option, choose between the Palazzo Hotel and the Aria Hotel. Both have been given LEED certification for their environmental approaches, which is impressive in a city that glows with neon lights. t's all too easy to stop in at the first bar you see on the Strip and, well, stay more than a while. But don't. Do make the effort to explore the rest of the Strip and you'll discover some truly great bars worthy of the epithet. Let's face it, it's kinda hot in Vegas so make a stop at Minus5 Ice Bar in The Shoppes at Mandalay Place inside Mandalay Bay and at Monte Carlo. You'll cool all the way down after the spring and summer temps have you all hot and bothered. It's a classy place in two of the city's most popular resorts. You're given insulated jackets at the door and inside there are sculptures and decorations all sculpted from ice. Some of the cocktails are even served in ice glasses. If you want 'stunning' in your vocabulary as you enter a bar, try the Chandelier at the Cosmopolitan. Perfectly formed flowing beaded curtains drop from The Chandelier's three-story structure and swoop to a curved return above your head. The bar has three levels for all tastes - whether you're after the Casino bar on the ground level, the middle bar for more serious cocktail imbibers or the third level for a more intimate experience. If you want high level drinking you need to head to the Ghostbar at the Palms. It's on the 55th floor and combines an awesome view of the city with spectacular internal fixtures and fittings. This is sophisticated and very stylish, with a decor featuring Murano-style chandeliers, porcelain tile flooring, plush banquettes with ornate wood-carved legs and a fireplace filled with flameless candles. Let's face it, you're not coming to Vegas for a good book and an early to bed lifestyle. So, what should you focus on in order to get major bang for your buck? Start with us, and find decent accommodation at very good prices so you can party the night away with a great place to crash at the end of it all. The whole place reeks of excess and you can get your fair share of it here - whether that be shopping, food or gambling. If you want all the glamor of those fine-dining celebrity restaurants that dot the Strip, head there for lunch instead of dinner. You receive the same exquisite food and the same delightful service at around 2/3rds the price. Value! Do you like your watersports? Head to the Golden Nugget with its three-story waterslide through a shark tank. Yup, something to tell the folks about back home right there. Again, daylight is the best time to hit some of the more extravagant hotel pools with their private cabanas, exotic thrills and to-die-for cocktails. Everything will cost you a lot less and frankly, they're more fun without the drunken night-time crowds. By the way - if you really want to take advantage of Las Vegas hospitality without paying the full dollar, check the casino hotel reception areas for the voucher books. Some of the two-for-one and so on deals are amazing and you'll also find a huge range of things to treat yourself with (like day spas, shows and more) at half price. Don't feel cheap - everyone does it and it's very accepted. It's hard not to love a visit to Vegas - there's so much to see and do and the restaurants, bars, casinos and clubs are always open. But what shows are the must sees if you have but limited time in Las Vegas? All the hotels and casinos are within reach of each other so your choice comes down to the price and the deal you're getting. Find a Las Vegas with a good package attached and you're on your way! 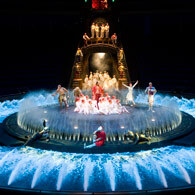 Le Reve is a water-based show at Wynn Las Vegas, inspired by a 1932 painting of the same name by Pablo Picasso. It's a dream sequence show with the most exquisite choreography - all inside or above a 1.1 million gallon tank of water. Synchronized swimmers glide through the water performing an elegant ballet. Aerialists soar through the air and dip into the water below. Absinthe is at Caesars Palace and there are two shows nightly - 8pm and 10pm. This is old-world burlesque at its best with world-class specialty acts and outrageous comedy. Absinthe is an adults-only, circus-style spectacular. Think strip tease, tightrope walking, circus acts and aerialist acts - something for everybody as they say. With all the drama of Winterfell, the Tournament of Kings calls all Lords and Ladies to a night of jousting, revelry, dancing and singing. This is a particularly good show for kids if you're traveling with them and the fun starts with the dinner menu (Dragon's Blood anyone?). There are knights of old, wizards and jesters - it's on at King Arthur's Arena on the Strip. There's nothing like a weekend break - or longer - in Las Vegas with several friends and a will to survive! Stay on the Strip if budget allows - this is where most of your action will take place. Find a Las Vegas room with a good package attached and you're on your way! You'll want to start the weekend off with a sophisticated vibe - if only to say that's indeed how you started - sophisticated and in full control! Our pick of the culture bars is in the Arts Factory, 107 East Charleston Boulevard where you'll find the wondrous Bar + Bistro in the very cool arts district. The locals hang out here for good reason - cheap drinks, a funky vibe and good food to start the evening off with sublime satisfaction. You could be forgiven for staying here all night. Frankie's Tiki Room is old school cool in the sense that it looks like a suburban hall, doesn't stint on the drink serves and won't be impressed by the gleaming plastic in your wallet. No poseurs here! But what you do get is a seriously good mix of cocktails, cold beers and plenty of locals just having a good time. Find it at 1712 West Charleston Boulevard. The Crown & Anchor on 1350 East Tropicana Avenue is a British style pub with the kind of relaxed drinking and range of beers that Brit pubs are famous for. This is no uber cool gin joint, just a homey, comfortable drinking establishment with fine service, 30 different beers and a range of what they call comfort food. First, check cheaprooms.com to find a central hotel in Las Vegas so you can enjoy the very best of the bars of Las Vegas - and still find your way back 'home'. How hard can it be? You're in Vegas, the town that never sleeps, the city with a thousand adventures around every corner... but you have to know where to look! First, check cheaprooms.com to find a central hotel in Las Vegas so you can enjoy the very best of Las Vegas - morning, noon and night. Most hotels are great value for money - fabulous locations, and excellent facilities. Find a Las Vegas room with a good deal on us and enjoy a weekend break - or longer - in America's favorite escape town. Is it truly the best show in Vegas? That's of course subjective, but do go and see Absinthe at Caesars Palace because it will absolutely knock your socks off. This is a cornucopia of entertainment; comedy, whirling, twirling acrobatics and the occasional adult theme (this is Vegas!). The outstanding performer skills and the sheer energy of the show will leave you breathless - go see it. Is this the very best swimming pool in Las Vegas? Well, we think so - you're unlikely to see a pool quite like it anywhere in the world. The pool at the Cosmopolitan Hotel is a step up from the usual blue tiles, and scattered towels... the actual pool is surrounded by adult toys - pool tables, tons of screens showing every sport taking place in the country and, of course, a Marquee Club for the serious poolside reveller. What constitutes the best day trip outside Vegas? The list would have to include places a short day trip ride from Las Vegas, something quite extraordinary to see and exotic scenery on the way there and back... which puts the Hoover Dam firmly in the spotlight. This engineering marvel tamed the mighty Colorado River and created North America's largest man-made lake, Lake Mead. We know you're in Vegas to party hard but that doesn't mean lashing out the big bucks for every single meal. You can dine well for not that much in Vegas. 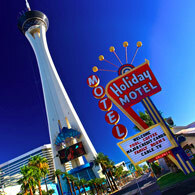 See Cheaprooms.com for quality hotels in the best locations of Las Vegas. There are more than 200 hotels in Las Vegas and many have weekend break packages that suit families. The Strip is very compact and takes about an hour to walk slowly from end to end. There are good deals on Cheap Rooms and almost every location close to the strip will work out fine. So you've partied hard, spent some cash and just need a mighty fine place to settle in for some excellent food? The Hash House a Go Go at 6800 W Sahara Ave serves up American pub food in a non-pretentious setting. Think burgers and grills with a culinary twist (some different flavors sneak in from time to time). The big red building beckons and you won't be disappointed. I Love Sushi at 11041 S Eastern is a great place to take the kids - everyone gets to taste what they want and the bite sized portions mean you don't waste a lot of food. The seafood is fresh and the range of flavors is perfect - a great place to take a picky bunch of kids. Pizza? You want good old, great, Pizza? Come and get it at the Original Settebello Pizzeria Napoletana at 140 S Green Valley Pky. Nothing but pizza on a great base with fresh toppings. No more to say! Las Vegas may not scream Creole cooking, but Lola's: A Louisiana Kitchen at 241 W Charleston Blvd Ste 101 does. Chargrilled oysters anyone? Crawfish ettoufe? The Creole cooking here is magical and the best news is it doesn't cost a fortune. The bar is open for pre-dinner drinks but you might have to book ahead on a Friday or Saturday night. Heading to the Chapel - Vegas style! Calling all romantics - if you're up for a little renewing of the vows - or even tackling the marriage game first time around - head to Vegas. It's cheap, it's fun and all your guests will have a blast. 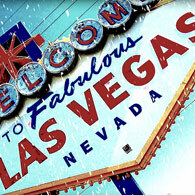 But first, check cheaprooms.com to find a central hotel in Las Vegas and let the lovin' begin! There are more than 200 hotels to choose from. 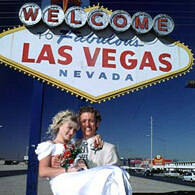 Find Las Vegas rooms close to the downtown strip and get ready to get hitched . First things first - choose your dates well. Valentine's Day (week) is very popular (think 5 hour queue) and so is the New Year's period. Choose dates that will work for your guests too, and if you have a lot of guests, think about a hotel chapel wedding. You'll save money by having the entire package - accommodation, reception and wedding itself - occurring in the one venue. And nor will you have transport issues between venues. Unusual weddings are a specialty here - Elvis, pirates, mobsters, Venetian themes - whatever you want, Vegas is your best bet for the most unusual. Because there is no waiting time applicable in Las Vegas, you can get married on the spur of the moment. But you're better off with a little planning - have your application filled in, book a reception venue and book transport to and from the chapel in advance. Spontaneity is cool, but a queue or no room for all your guests will kill the passion. You can rent everything here - even the wedding dress and the tux. Jewelry stores will have the perfect wedding ring and you can have makeup done in the hotel very easily. Consider an evening wedding during summer - the daytime temps are make up-meltingly high, and the balmy evenings make for a pleasant celebration. The wonderful thing about Las Vegas is its ability to cater for every need - including the foodie. Go to cheaprooms.com now and find a cheap hotel in Las Vegas and, in particular, note just how good the prices are for the premium properties. And the really good news - Las Vegas is a great place to visit no matter what time of year it is. Do make sure you book your discount hotel room in Las Vegas soon, though, because it's extremely popular and the good rooms in the better properties go quickly. 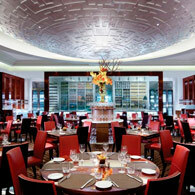 One of the most popular restaurants in the Las Vegas fine dining scene is TWIST by Pierre Gagnaire. He's a three star Michelin chef and it shows in the range of foods he cooks as well as the extraordinary ingredients that go in to many of the dishes. The best value and the best way to experience Pierre's twist on gastronomic heaven is to take on the Six Course Tasting option. Alize is in the Palms Casino Resort and offers am exquisite French dining experience. Chef Andre Rochat was instrumental in establishing Las Vegas as a fine dining experience more than 20 years ago and the culinary adventure he presides over continues to draw appreciative crowds. 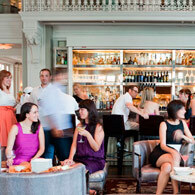 Think fish, meat, and poultry and a wine list of more than 1,800. Il Mulino New York in the Caesar's Palace shops is a formidable restaurant resplendent with beamed ceilings and glamorous chandeliers. None of which takes away from the food. Their petite selection of hors d'oeuvres is rightfully famous as is the impeccable service and the traditional Italian dessert menu. Perhaps the most famous restaurateur of them all in Vegas is Joel Robuchon. His eatery on the strip has drawn salivating crowds for years - many come for the stylish red and black decor, but most are there for diverse selection of French-influenced tapas and entrees that can be sampled alone, or enjoyed as stand-alones in a tasting menu. America's 'go to' place for frivolity, fun and serious entertainment is a busy little town. It seems something opens every week, something changes, and everything gets bigger and better. If you're coming to Vegas, make sure you know what's happening. Here are a couple of things to look out for in the coming months. But first, check cheaprooms.com to find a central hotel in Las Vegas and give yourself a great home base from which to explore the world's most fun city. Las Vegas and its Strip are prime spots for people watching. 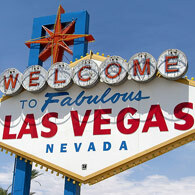 Find Las Vegas rooms in the downtown area on our website. There are plenty of bargains to be had, but be quick for the better properties. Most clubs and the casinos run with the 'any excuse for a party' theme. At Moon, for example, they hold a full moon party every... well, full moon. Generally there are special guests and the theming is a lot of fun with special drinks, lots of decoration and the staff love it too. Penn and Teller run a nightly show at their own venue at 3700 W. Flamingo Rd from 9pm. It's not your typical magic show - the pair spend time debunking a lot of urban myths and demonstrate it with magic. It's a fun show and suitable for children too. Donny and Marie are on nightly at the Flamingo Showroom. It's classic variety - humor, music and reminiscing all thrown together for a good night out. You forget how big these guys were when their TV show was number one in every market. Donny, for example, had 18 gold records and several top 10 hits. Remember the days of the Rat Pack? They're back. The Crown Theater at 3700 W. Flamingo is showcasing four great voices and a 12-piece band who will run through all the hits. If you're a nostalgia fan, this is the show for you. Girls shopping trip to Vegas! 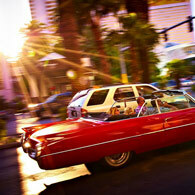 It may seem counter-intuitive - after all, Las Vegas is a wild adventure town isn't it? Rather than a shopping mecca? But don't let appearances fool you - there is a huge array of shopping choices here, tucked away in the side streets, off the casino lobbies and in 'destination' malls. First thing to do is browse cheaprooms.com to find a central hotel in Las Vegas as your 'girl's weekend' home base. The sheer number of hotels in Las Vegas means that you'll get a great deal in a locality you like. Check Las Vegas rooms on our website. There are plenty of bargains to be had, but be quick for the better properties. Most shopping is in the malls (much like Dubai, for example) which means you're out of the heat for most of the day. Are you after designer gear? Then explore the walkway between the Bellagio and Caesars Palace. All your favorites are here: Armani, Bottega, Veneta, Dior, Chanel, and more. Look out for the sales racks - most of the shops have them going all year round. Do you want great shopping at prices the locals pay? Then a hire car is in order and you're heading to Town Square mall on 6605 Las Vegas Boulevard South. Main street labels such as Express, American Eagle, Gap, Old Navy are all set around a pretty square and surrounding streets with restaurants and bars in between. It's friendly and not so exhausting! Crystals is Las Vegas' newest mall and the brand new feel is most enjoyable. The architecture looks great and the wide range of shopping choices, plus a real arty look and feel with the open-air sculptures and installations, add to the cool vibe. It's always fun to visit Las Vegas, and does all that action ever get tired? No, we didn't think so... but! Should you need a day of downtime, how about visiting some of the attractions just beyond the city limits? 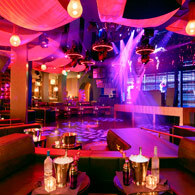 Check Cheaprooms.com and get yourself to Las Vegas with a cheap hotel packageto suit every budget and every occasion. The glorious Vegas hotspots may all be indoors and air-conditioned, but if you're venturing beyond the city limits, check the weather forecast for Las Vegas before you come so you know what to pack for. 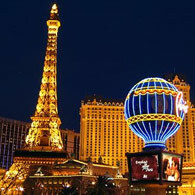 Find some cheap accommodation in Las Vegas and get ready to enjoy all there is in this action-packed city. As much as there is to enjoy in Vegas and all that is there is to offer, it's nice to take a break from the Strip and venture into the great outdoors, or even just something quite different. The Red Rock Canyon area is a magical, mystical site in the Mojave Desert. It's about 15 miles west of Las Vegas and you can take a hike around a 13 mile loop. You'll see all sorts of desert flora including Yucca, cactus and Joshua Trees, as well as the unique red rock formations. The Ethel M Chocolate factory is about 10 miles from Vegas and is an ultra-modern tribute to that most glorious of snacks - Chocolate. The Ethel M people have been making chocolates for years. The tours walk you though the chocolate making process and you get to sample the goodies at the end. The Valley of Fire State Park is about 95 miles northeast of Vegas so you'll need a hire car. This is the oldest State Park in Nevada and was opened to the public in 1935, containing nearly 35,000 acres. It features more the exquisite rock formations and striking colors. The Hoover Dam was built in 1935 and still stands as one of the 20th Centuries greatest building projects. There are exhibits on display, including some magnificent art deco statues near the entrance. Things to do on the Vegas strip! You can have all the fun in the world in Vegas without even leaving the Strip! Check cheaprooms.com now and find a cheap hotel in Las Vegas so you can get hit the strip, get some action on the tables and eat in style! From its mob beginnings, Vegas has come a long way - and the history is well worth reading if you have the time, because the 'sin city' reputation of Las Vegas stems directly from it. You'll be spending a lot of time walking the Strip, so good shoes and stylish clothing that will get you in the door is important. Do make sure you book your discount hotel room in Las Vegas soon, though, because, no matter what the season, good deals go quickly. The first stop for most Las Vegas visitors is The Strip. There are gaming rooms galore of course, but if you want to see something a little different, your first stop is the Fountains at the Bellagio. Choreographed to music, it's a fabulous sight. It's not the real thing... but the Gondola Rides at the Venetian are a local 'must do' these days. And the best part - they don't cost anywhere near the same as the rides in Venice! You may even get a tune or two out of your Gondolier! If you've brought the kids, why not try the Indoor Skydiving on Convention Center Drive? It's essentially a large trampoline, padded walls and a huge tunnel that shoots you up in a current of air. It sounds fun, and it is. The gaming rooms not adventurous enough for you? Wooh nellie! You clearly need to visit the Manhattan Express Roller Coaster on the Strip. The roller coaster flies in and out, round and round with a height of 203 feet, drops of 144 feet and speeds of 67 mph. This place really doesn't sleep - which is just as well because there's so much to see and do in Las Vegas you need 24 hours a day just to get close! Check cheaprooms.com now and find a cheap hotel in Las Vegas so you can get ready to enjoy the best vacation ever in the town that never sleeps. So with all that 24 hour time on your hands, just what are the best shows to see in Las Vegas? Depends on your taste of course, but we do have some recommendations. Do make sure you book your discount hotel room in Vegas soon, though, because the best off-peak deals go quickly. The number one show getting all the rave reviews is Cirque du Soleil - O the so-called aquatic masterpiece. It's on at the Bellagio and features a great storyline plus the most stunning acrobatics possible. It's well worth the price and a highlight of your stay in Vegas. Absinthe is on at Caesars Palace and is a stunning circus show with hints of Rocky Horror raunch. Comedy and acrobatics vie for your attention and the old time circus acts (check out the stacking chair act) will have you on the edge of your seat. If you love the Beatles then check out the Cirque du Soleil version. They do all your favorite tracks set to acrobatics and athletic dancers. The vocals are great and the best part is the backstory of each hit. La Reve - The Dream is at Wynn's and is set in a great venue. The stage is water and there's a 'splash zone' for seating so be warned. Think aquabatics and stunning twists and turns, jumps and moves.